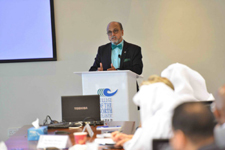 The College of North Atlantic – Qatar (CNAQ) hosted the UNESCO- UNEVOC Centre Qatar Seminar Series in its campus. As part of this series Dr. R. Seetharaman, CEO of Doha Bank spoke on “Environmental sustainability and Corporate Social Responsibility in Banking Sector” on 21st March 2017. The event was Chaired by Dr. Ken MacLeod, President CNA-Q and the introduction of Doha Bank CEO was given by Dr. Rupert Maclean, QAPCO Professional Chair of Vocational Studies and UNESCO chair on Technical and Vocational Education and Training and Sustainable development. In this concluding remarks Dr. R. Seetharaman highlighted the uncertain global scenario and challenges in implementing climate change reforms. However global sustainability should aim to address climate change issues and thereby build green economies. The event also had a Question and Answer Session.